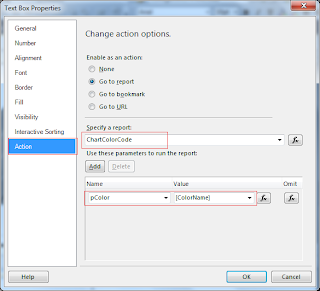 In this article, I will explain how to change the color of a chart dynamically. 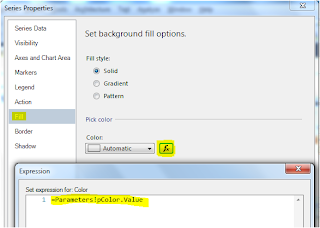 In other words, how to provide custom color palette feature at run time. Lets start off with an example including step by step operations. Step1. Open or create new Report Server Project. I am creating a new Report Server Project using SQL Server 2012 and saved it with LearnSSRS2012 name. Step2. Add new Shared Data Source by right click on "Shared Data Sources" folder. Now give any name to Share Data Source (Local, in my case) and click on Edit button to define Server Name and Database Name. In this example, I will use static data sources so I am using "." (you can also use "(local)") as ServerName. 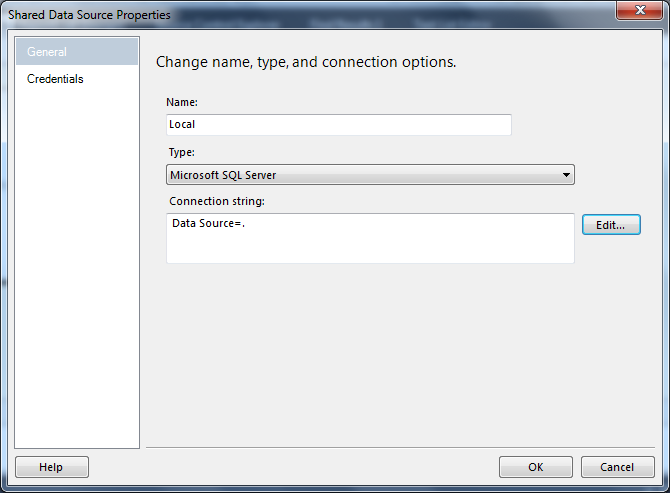 I am not defining any Database name so I will keep it blank (default will be msater). You can define any database, if you want. Now click on OK.
Step3. Now create a new report by clicking on Reports --> Add --> New Item --> Report --> Add. 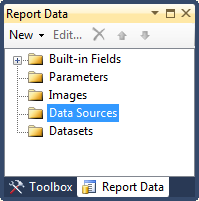 I don't like default report name like Report1, Report2, Report3 so I have renamed it to ChartColorCode.rdl. We will use Shared Data Source we created above. 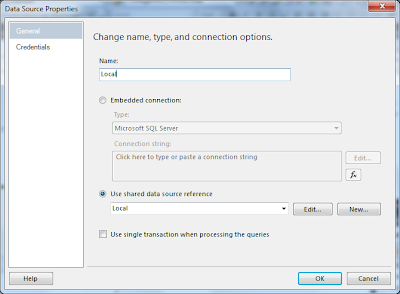 So click on "Use shared data source reference" and select Local data source created at step 2. Give any name to this report level data source. I will assign "Local" again. Click OK to proceed. I will use two data sources in this example, one for Color Palette and another for Chart. 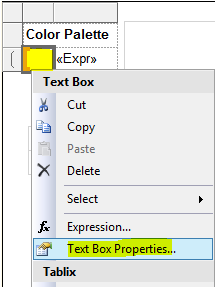 To create new Dataset for ColorPalette, Right click on DataSets --> Add Dataset... and type "ColorPalette" in Name textbox. 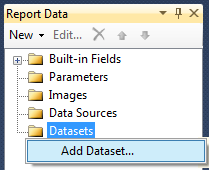 Select "Use a dataset embedded in my report" option and select Local as Data Source. Step6. Drag and drop "3D Cylinder" bar chart from toolbox. 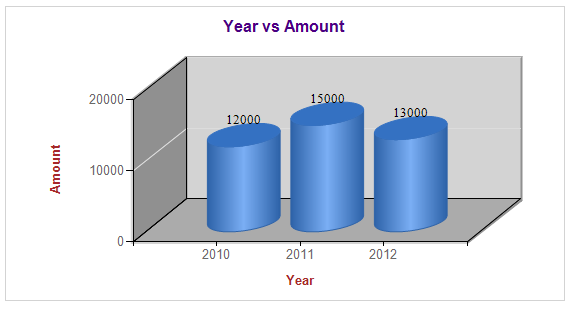 Drag and drop Amount field from Chart.ds to value field (Y axis) and Year field to Category Groups as shown below. 1. Replace Chart Title with "Year vs Amount". 2. Replace Y Axis Title with Amount. 3. Repalce X Axis Title with Year. 4. Remove the Chart Legend. 5. Change the font size and color as you wish. 6. Right click on the bar and select "Show Data Labels". Select Times New Roman in data labels font because numbers are better visible in this font. Step7. Now I will explain how to change the chart color at run-time. 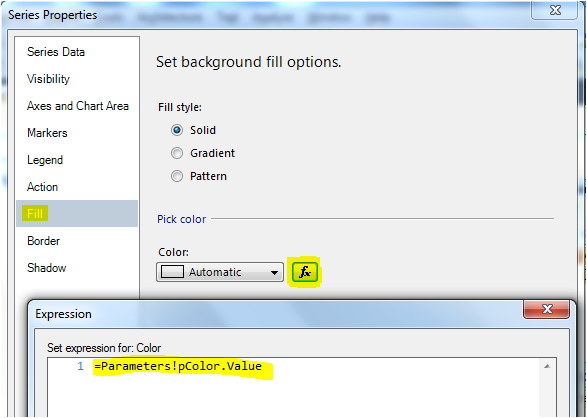 First of all, I will create a report parameter for dynamic color. 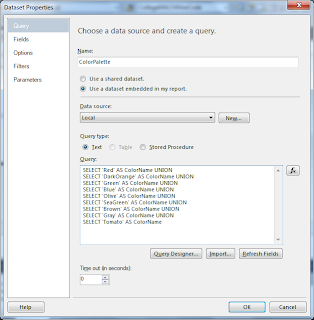 Click on Parameters folders in Report Data and then click on Add Parameter... Define pColor as report parameter Name and Color as Prompt. 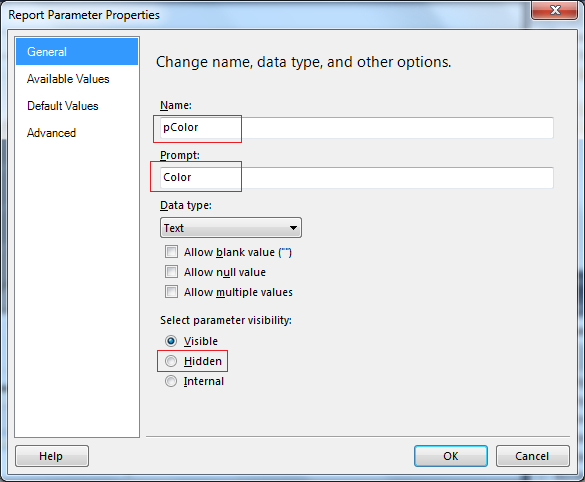 Select parameter visibility Hidden. You can keep it as Visible if you wish to do so. Click on Available Values under Report Parameter Properties window. 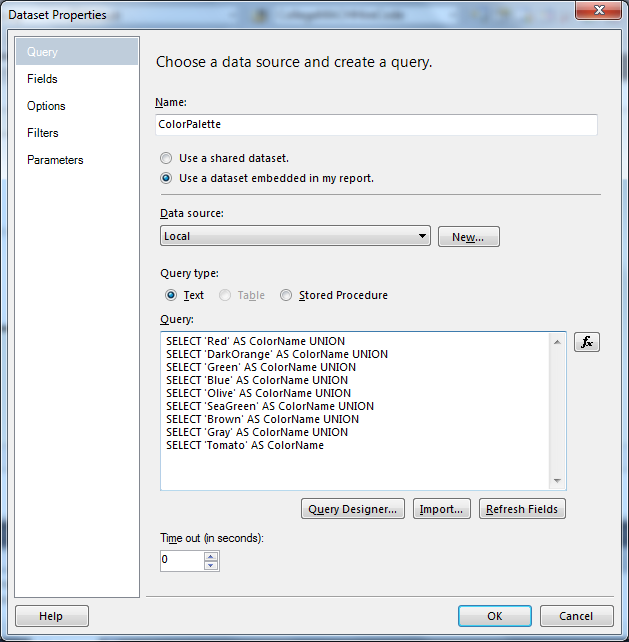 Select "Get values from a query" option under "Select from one of the following options". 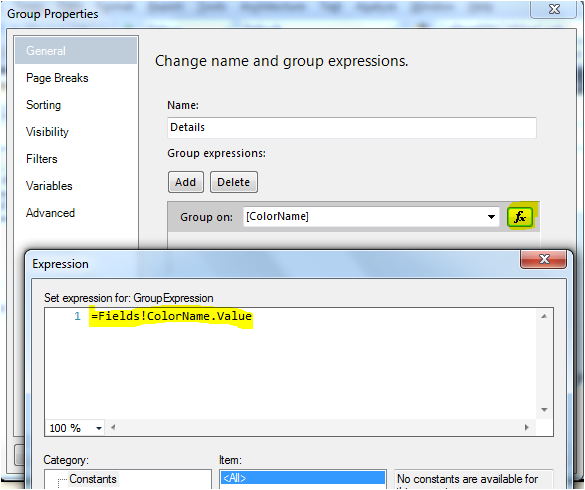 Select ColorPalette in Dataset box, ColorName in "Value field", and ColorName in "Label field". 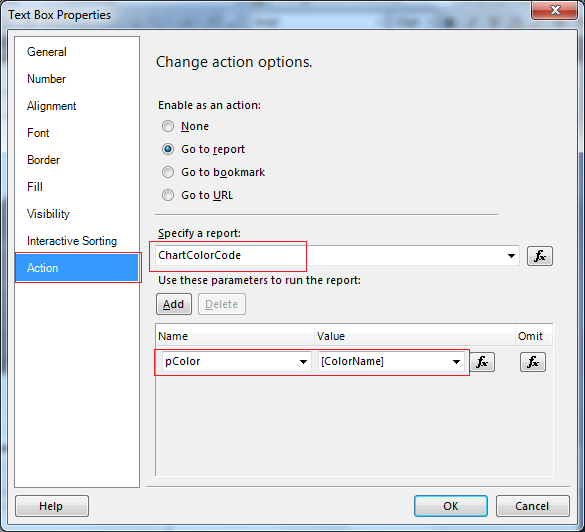 Click on Default Values under Report Parameter Properties window. Select "Get values from a query" option under "Select from one of the following options". Select ColorPalette in Dataset box, and ColorName in "Value field". Click OK to proceed. Step8. Drag and drop Table control from toolbox. Do set following properties for table control. a) Table control will have three default columns. Delete one column. b) Merge Table Header and write "Color Palette" in the textbox. c) Write following expression in the second column of Table Details. 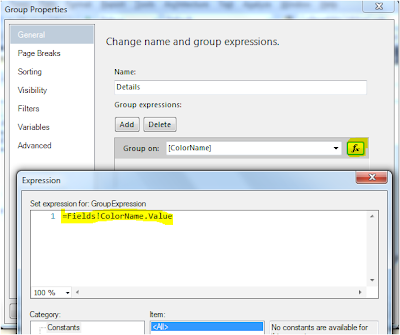 d) Select Table Details and then right click --> select "Row Group" --> select "Group properties"
e) In "Group Properties" window, click on expression button under "Group on" box and write following expression =Fields!ColorName.Value. Step9. 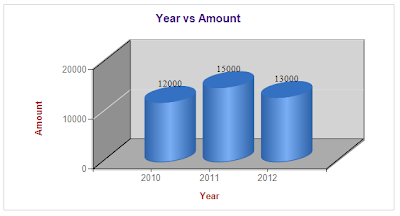 Now we are at the final step where we need to change the properties of bar chart to change the color at run time. 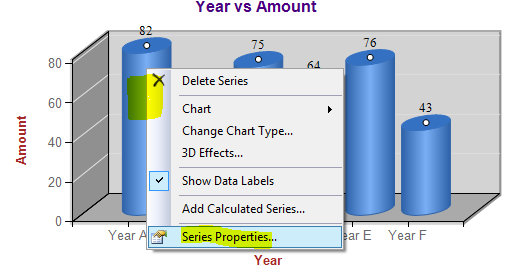 Right click on bar chart and select "Series Properties". Step10. Its time to run the report and see the results. I hope you like this article! Really Good blog post about dynamic color coding in ssrs charts.provided a helpful information.I hope that you will post more updates like this. I like this blog, saved to my bookmarks.I have got some important suggestions from it. nice blog..Thanks for sharing the information.keep update with your blogs.. Here are few FREE resources you may find helpful. Hari Sharma is a Microsoft Certified IT Professional. He is a dynamic and proficient Sr. SQL BI Dev who specializes in diverse technologies like SQL Server 2005/2008/2012, BI, OLAP, Data Modeling, Data Warehousing, SSAS, SSIS, SSRS etc.